I was going through my photos today and found this pic of Peanut's kitty-Mommy. You can also see all her brothers--little orange munchkins with no tails! I think it was taken the day they were born, or the next day. 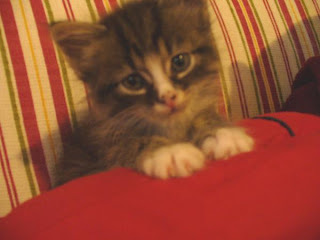 And look, even from day 1, she is no where to be found when the camera came out! I've showed it to her a few times and she usually comes over and looks at, sometimes licks it, and wanders away. Always makes me wonder if she knows who it is. Or if she misses them. PB: This is my family? I don't see the resemblance. I'm pretty and fluffy. Oh wait. It's those weird orange things again. They were annoying. I think I may have to give you a warning. As you read on, you may notice a slight...schizophrenic feel...to Peanut Butter's stories. Sometimes, she sounds like a sweet little innocent kitten. And others, she is a diabolical little gremlin. Welcome to the daily life with my multi-personality kitty! You never know what kitty you are going to get. Hours can go by and she is a cuddly love muffin and then something doesn't go her way--like me telling her, "no, please don't scratch the new couch" or "time to come inside, I'm getting cold and want to close the window" and look out! Crazy Gremlin-like monster comes out. There are three distinct personalities I have discovered so far. Can you tell which one she is in this pic? 2. Princess GiGi: She is slightly disdainful with a touch of royal airs. She sits regally on her many thrones about the house and truly cannot understand how a minion like yourself can think you are worthy of touching her. Tends to say "I'm pretty" or "look at my pretty tail." 3. Stewie. Aka Gremlin, Crazy Monster, Evil Monkey. Appears when cameras are around, Mommy tells her no or attempt to scold her, humans don't give her bites of their human food, or something just snaps inside her. Tends to speak like Stewie from Family Guy, plotting to kill or at least maim anyone around her. Hits, bites, scratches and is downright vicious. 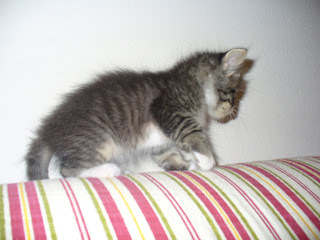 Mommy showed me more pics from when I was little and fuzzy. She said these are from my first road trip! When I was really little she went to see her friend Droolyana and I got to go with her! I was really scared but Mommy bundled me up in a really warm, soft blanket and let me hold on to her finger for most of the trip. I liked it at Droolyana's. She had lots of places for me to explore and play. Mommy said I was a crazy monkey there. But I just think I was a cute kitty! Just for the record, my friend's name is Juliana, not Droolyana. These were taken back when Peanut actually liked the camera and didn't try to hit it. Mommy got out my baby pictures today. Said she was feeling 'stogic because its Christmas. Don't know what that means but I like Christmas. I get red mice. 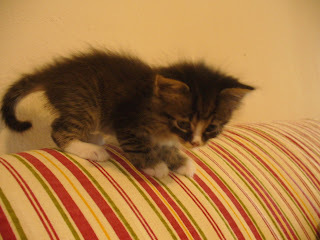 Look how cute and little and fuzzy I was. 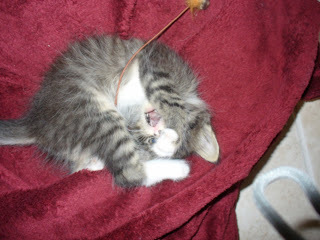 Mommy said this was when I started my "ackward" stage. I think that means pretty, don't you? Before we continue on our journey and take you along on our adventures, we must first introduce you to Red Mouse. 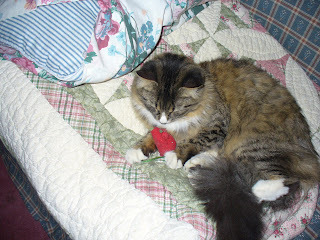 Because there is nothing, absolutely nothing, that Peanut Butter loves more than Red Mouse--including me. 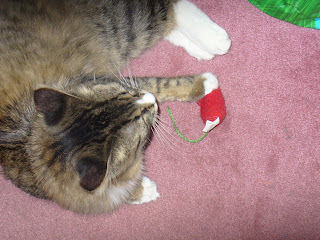 Last year at Christmas I was at a Petco and picked up a red mouse and a green mouse, one for each cat, for $1 each. Peanut Butter: RED MOUSE!!!!!!!!!!!!!!!!!!!!!!!!!!!!!!!!!!!!!!!!!!!!!!!!!!!!!!!!!!!!!!!!!!!!!!!!!!!! The best Christmas of my life! Well, my cat became obsessed with hers. Like a security blanket, she began carrying it around the house. Not a day went by that you didn't see the two of them together (except for when she was batted under the tv, bookcase, stove.....) Like Linus and his blanket. And she is actually known to get quite vicious if you taunt her with Red Mouse and dangle it in front of her or try to play with it. PB: MY RED MOUSE!!!!!!!!! GIVE HER TO ME NOW! I have bought her countless other toys and mice: with fur, with feathers, some that jingle, some that are even red. 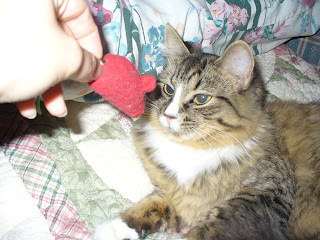 And sure, she'll play with them on occassion, usually when Red Mouse is MIA or I throw them at her, but it's always half-hearted. PB: Who cares about a stupid jingly ball. Stupid thing rolls under everything and gets lost. Gimme my red mouse! Peanut Butter and I had to go home to NY for a few months and like a good mother, I packed Red Mouse. And oh, the adventures the two of them had together! Peanut took her everywhere! You never knew where Red Mouse would turn up next---although often she was on the front door mat. PB: *quite huffy* It was a present for you to show you how much I love you! Fine. Next time it will be a dead mouse or lizard! Ha! I thought I was crazy for a while because Red Mouse started showing up all over the house. We'd go to bed and she would be downstairs, yet in the morning, she would be upstairs next to my bed. Turns out, Peanut would go downstairs to find her and then carry her upstairs to bed in her mouth. I've never seen anything like it with a cat. Dogs, yes. Cat's no. PB: Dogs are stupid. Can't even go to the bathroom by themselves. 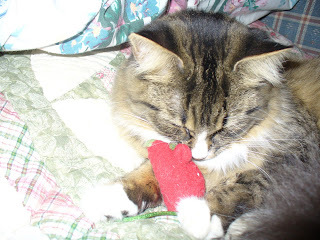 When we came back to Florida, I had to start bringing Red Mouse to bed with us beause we slept with the door closed so the other cat wouldn't come attack Peanut. PB: Shutup. I don't tell people you still sleep with your teddy bear. Or that you snore. Gimme Red Mouse. Red Mouse is known to go missing for days, sometimes weeks. Yet Peanut always knows exactly where she is at all times because most of the time, she magically reappears after a few days without me having to go searching on my hands and knees. PB: Sometimes she pisses me off. I put her in a timeout until she was ready to be nice to me again. I know it wasn't a crazy adventure but everyone that knows me and Peanut, knows about Red Mouse. They are inseperable BFFs! PB: Where is she? What did you do with her! Give her to me now! Day 1. Adventures not going well. Peanut Butter was off playing in her tunnel and having fun. Thought I would show you her cute playful side. This is what happened when I attempted to take a video of her. Peanut: Get that G&%#*D*(^%&* camera away from me! Stupid paparazzi alway up on me. Once again my little buddy is keeping me company into the wee hours of the morning and I'm thinking how I can't imagine my life without her! And that always makes me smile because she wasn't even supposed to be my kitty! Last June my roommate decided she wanted another kitty, a playmate for her older cat Bailey. 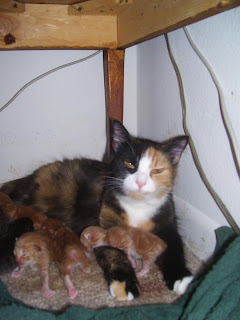 Her friend's cat had just had kittens so she decided to bring one home. And she brought home the sweetest little 6-week-old munchkin! 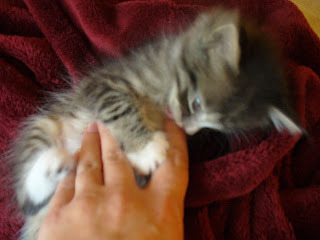 She was a tiny puffball that fit right in the palm of my hand and her tail was longer than she was. Peanut Butter: I remember being with my Mommy--the fuzzy one---and all my weird looking brothers. I didn't like playing with them. They were not pretty like me. They were orange and had no tail. And I have the prettiest tail. It's so long and fluff and beaufiful......then some lady came and took me away from them. And she called me a cotton ball. But Bailey, the 20 pound cat, was less than enthused with the new addition to the house. She didn't think the little pile of fuzz was cute or adorable and attacked the peanut right away. PB: aaaaaaaaaaaagggggggggghhhhhhhhhhhhhh!!!!!!!!!!!!!!!!!! I hate that monster. PB: The lady saved me and bundled me in a really soft blanket. It was the best sleep of my life! How could I not fall head over heels with her? And from that moment, she became my little kitty, and my best friend! PB: *licking myself* Hmmm...I'm pretty. Welcome to the adventures of Peanut Butter and Jenny! All of us pet owners think we have the best pet, we would be bad parents if we didn't! And I'm no exception. Not only is my cat beautiful (and everyone tells her so) she is absolutely hysterical. She get's herself into so many situations daily--I'm glad to work from home now so I can keep my eye on her. 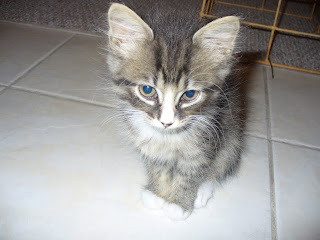 She was a little tiny grey fluffball when we got her and her name was supposed to be GiGi--to stand for little Grey Goose to go along with my roommate's cat Bailey. But it never stuck. 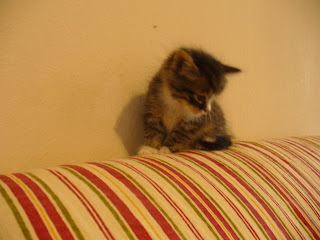 PShe was so little I found myself always calling her my little Peanut. Plus, her grey and white started turning brown. And one day I called her Peanut Butter and it's been my pet name for her ever since. It is known to change daily. Last week I decided Ravioli was a cute name and tried that. She wanted no part of it though. She does, however, respond to Ferret, Monkey, Crazy Monkey, Monster, Evil Monster/monkey, munchkin, pumpkin, muffin, fuzzbutt, fluff, and pretty girl. She is extremely narotic and downright strange sometimes but the funniest thing about her is her skittishness. She has come out of her shell in the last months but mostly she is a big scaredy cat and aloof. She truly hates being touched although she has gotten better about it and will let me cuddle her for a few seconds at a time. And she is extremely camera shy. She HATES it and usually flees the moment I take it out. So I invite you to join us on her adventures as I try to capture them on film. No guarantees though, she's quick and she hides!